Extremely thick molasses-coated amber ale with wonderful chocolate vigor. As black as Guinness in appearance, and almost as incredible. 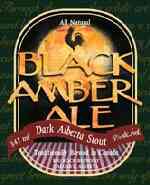 Though not water-based like most Canadian brews, Black Amber retains clean crispness despite such dark auspices. Blackened caramel malts, powdery cocoa bittering and ashen dried fruited backdrop compatible to light porter styling. Lengthier creamy finish would suffice, but no one is arguing.